You must sign into your myHangout account in order to contact johnboyrox. Well, we had our festival saturday. It went great. I am feeling all kinds of inspired. about 500 people showed up and were exposed to a full day of free bluegrass. Thanks Tater and Bluegrass! You both played great. johnboyrox has 19 friends. View entire friends list. I went to the Worlds fair in Tennessee when I was 7, rode with my uncle who was a bluegrass fan, we listened to a bunch of old stuff and I was hooked. Got my banjo for my 8th birthday. I played in the "Clarksdale Band" when I was 12. Played a bunch at church. At 18, I started a group called "Sons of Thunder" in college and played for two years. Sang in a gospel quarted for a few years. 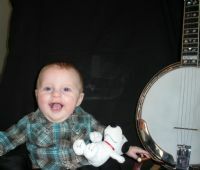 Now I've settled in Kansas and sing at church and teach banjo at Ottawa Music Shop.